In the early hours of March 30, 1867, Russian Minister Edouard de Stoeckl and U.S. Secretary of State William Seward signed the treaty that would ultimately transfer ownership of Russian America to the United States. Though many people know the basic outline of this story, few realize the international impact of the sale. Reactions to the Alaska Purchase were often strongest in Canada and Great Britain, for obvious reasons of territorial proximity, but there were also serious concerns in France, Prussia, and the Ottoman Empire. Many nations saw the purchase as an important step in the formation of a Russian-American alliance and feared what such a relationship might bring. 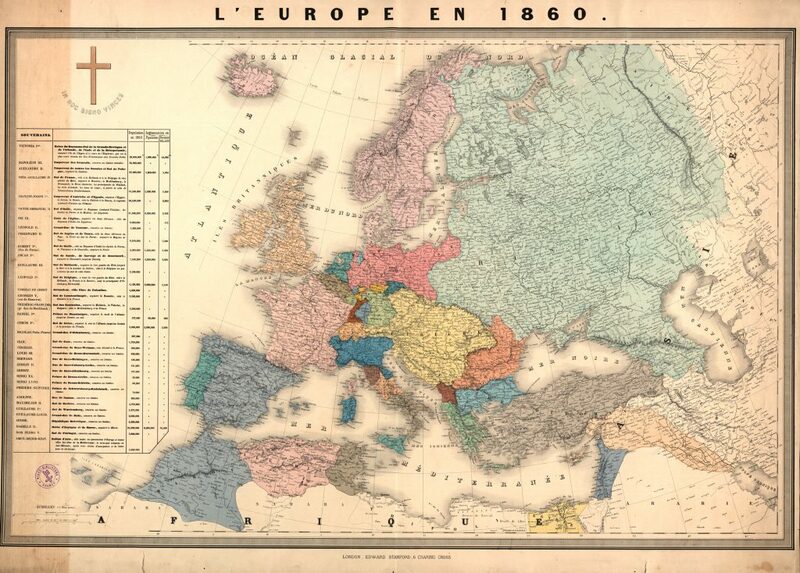 Europe in the 1860s was a rapidly changing landscape, fueled by nationalism in its various forms and the international rivalry that was usually a byproduct. In the midst of this international turmoil, the sudden announcement that Russian America had been ceded to the United States elicited a variety of reactions across Europe. Several U.S. officials serving in Europe remarked that the news had taken everyone completely by surprise. “It is, indeed, astonishing,” William Murphy, U.S. consul in Frankfurt on Main, wrote, “what deep and exciting impression the first short and abrupt telegraphic report of that unexpected change of territory produced amongst the different political circles of Europe.” There were rumors that the Alaska deal included America’s promise to back Russia up on its territorial ambitions in Europe and the Near East. The Austrian paper, the Neue Freie Presse, for example, speculated that the government of the United States had “obligated itself in an agreement for the cession of Russian America in support of the Russian government in the Orient and using the American Navy if necessary.” The cession of Russian America was consistent with Russia’s emergence from isolation, and had gained the growing nation two things: money for its treasury and an alliance. Bolkhovitinov, N. N. Russian-American Relations and the Sale of Alaska, 1834-1867. Ontario: Limestone Press; Distributed by the University of Alaska Press, 1996. Despatches from U. S. Consuls in Frankfort on the Main, Germany, 1829-1906, NARA, M161 (Roll 16 and 17). Despatches of U. S. Ministers to Turkey, 1818-1906, NARA, M46 (Roll 20 and 21). Neue Freie Presse (Vienna). Karl Marx to Ludwig Kugelman, February 17, 1868, in Collected Works, 2d ed, by Karl Marx and Friedrich Engels, NY: International Publishers, 1975-1983 32: 542. Count Otto zu Stolberg-Wernigerode, Germany and the United States of America. Reading, PA: The Henry Janssen Foundation, 1937. Lee A. Farrow is distinguished teaching professor in the Department of History at Auburn University at Montgomery, director of Auburn’s Center for Excellence in Learning and Teaching, and author of Seward’s Folly: A New Look at the Alaska Purchase (2016).